The countdown is on at Fable maker Lionhead Studios! Go to the Lionhead Studios website and you'll notice that things have changed a bit. 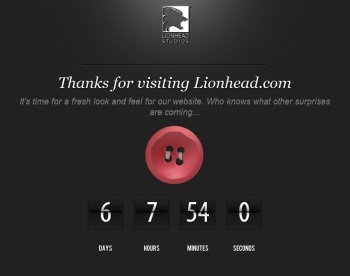 "Thanks for visiting Lionhead.com," the site now says. "It's time for a fresh look and feel for our website. Who knows what other surprises are coming..." And there's a countdown! And a red button, not particularly shiny or candy-like, and the sort you'd use to button your shirt, not to erase history. What could it possibly mean? I have no idea but as CVG notes, Microsoft recently began looking for a lead engine programmer for Lionhead with a knowledge of the Unreal Engine and Direct3D 11, something the current generation of consoles doesn't support but the next generation presumably will. Lionhead is currently working on Fable: The Journey and in June 2011 he revealed that the studio also has a "super secret second project" on the go. Since the new Fable game is already on the radar, the obvious hope is that the countdown will end in a reveal of the second project - and, since we're casting wishes into the wind, that it'll be a new Magic Carpet. Unless my calculations are wrong [which is always a risk] the Lionhead countdown will hit zero 7 pm EST on March 5.